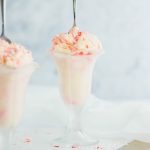 With a festive pink swirl, a fresh, minty flavor, and bits of candy cane crunch, this Candy Cane Swirl Ice Cream is the perfect festive winter treat. Welcome to the second recipe of Peppermint Week! It’s all so good, but today’s offering has a special place in my heart because, well, ice cream. It really is one of my favorite indulgences, and I love it just as much when it’s cold outside. This Candy Cane Swirl Ice Cream is the perfect Christmas ice cream recipe. It’s fresh, and bright, and the pink swirl with crunchy bits of candy cane throughout? As festive as all get-out. And while the chocolate may not be obvious in this one, it’s there in the swirl. After making a syrup of water and candy canes, whisk in white chocolate to make a mix-in that’s a perfect shade of pink. Thank you, candy canes. Now, there’s a bit of science involved in the swirly bit. As a rule, chocolate and water do NOT mix. It has to do with the exact science of how sugar crystals shape and bond with the chocolate, and how they would really rather just take the easy road out, break up with the cocoa solids, and bond with water. Also, you don’t want it to freeze hard in the ice cream, because then you couldn’t scoop it. Which means tragedy has struck. But we’re going to work around that by adding whipping cream (fat) to keep the chocolate’s sugar faithful and corn syrup to prevent hardening. And as you stir the chocolate in, whisk that baby like your life and the lives of all those you love depend on it. Your reward for all of that arm work? You get a sweet, minty ice cream that will make the beloved faces you saved light up and ooh and ahh. Because I mean, look at that stuff. That and perfectly toned biceps, of course. For the Ice Cream Custard: In a medium sized bowl stir together 1 cup of the whipping cream and the peppermint extract, then place a metal strainer over it. In a small mixing bowl beat the egg yolks with 1/4 cup of milk. Stir together 1 cup of milk, 1 cup of the whipping cream, sugar, and salt in a medium sauce pan over medium heat until it is steaming and the sugar has dissolved. Temper the eggs by slowly pouring about half of the hot milk and cream into the eggs while whisking continuously. Pour it all back in the saucepan and cook over medium-low heat while stirring continuously—I like to use a rubber spatula to make sure that nothing sticking and scorching on the bottom of the pan. Keep cooking until the mixture has thickened and coats the spatula. Remove the custard from the heat and pour through the sieve into the extra cup of whipping cream and peppermint extract. Stir well, cover with plastic wrap, and place it in the refrigerator until thoroughly chilled-overnight is best. For the Swirl: Combine 6 of the candy canes with the water in a small saucepan. Simmer together over medium heat until the candy canes are completely dissolved and it has reduced slightly, about 8-10 minutes. Set it aside to cool. Once it has cooled completely, melt the white hot chocolate over a double boiler or in a microwave-safe bowl, stirring every 10-15 minutes to prevent scorching. Whisk in the whipping cream and corn syrup until well combined. Gradually and slowly add the melted white chocolate, whisking continuously to make sure that it emulsifies. Place the candy cane chocolate mixture in a disposable zipper bag and chill it thoroughly. To Freeze the Ice Cream: Place the container you wish to store the ice cream in the freezer to chill it thoroughly. It’s better to use something fairly flat and open for the swirling. Unwrap the remaining 6 candy canes and crush them— you can pulse them in a high-power blender or food processor, or place them in a ziploc and hit them with a mallet. Also, snip a small corner off of the bag of candy cane swirl. Churn the custard according to your freezer’s instructions. When it is ready (and working quickly to avoid melting), place a third of it into the container you are storing it in, then drizzle some of it over the ice cream and sprinkle with a third of the crushed candy canes. Repeat with the remaining thirds of ice cream, swirl, and candy cane. When you have finished layering, run a table knife through it to create swirls. Cover it with plastic wrap and return to the freezer until it’s thoroughly frozen, at least eight hours.